Have you ever wanted to slump float glass (window glass) or pattern it? Or use float glass as the base for a fusing? Then you need to get determine which side of float glass is which. You need a Tindicator. Just like much art glass, float glass is fire polished on its top side; the molten glass flows to leave a smooth flat shiny surface. The bottom side of float glass is different: it forms against a bed of molten tin. This gives its second smooth flat shiny surface, and our perfectly transparent windows and glass tabletops. The tin has a subtle effect on the glass. A tiny amount of it is absorbed into the under side. That side of the glass is more liable to devitrification, may not take enamels as well, and may be harder to fuse; so if you want to use float glass in slumping or as a base for fusing, then the tin side should be down against the kiln shelf, away from the fusing interface. The Tindicator (or tin indicator) is a battery-operated source of UV light. Take your (cleaned) float glass into a very dark place, hold it at about 45 degrees down, and shine the UV from under on it. If it is shining on the tin side, you should be able to see a slight bluish-white fluorescence. Turn the glass over and compare. 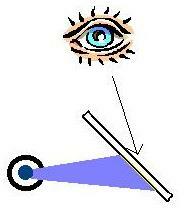 Since the glass itself absorbs UV, the fluorescence only occurs on the side near the UV source. Some glass has much less tin than others. Some people shine the UV on the top side of the glass (but don't look at the tube).  Hunt through your hardware stores and camping shops until you find a torch (flashlight) with a 4 Watt 6 inch fluorescent lamp. Sometimes these are made for campsites, so the bulb bit is useful for a beam and the fluorescent for lighting up a small area such as inside a tent or around a campsite. See the photo of the one I bought as an example. You might find something different; you might even find a cheap mains-operated desk lamp. The only fixed requirement is that it must take a 4W 6" tube.  Then ask an electrical supply store to order you in a 4W 6 inch 'black light, blue' tube. It might have the part type G4T5 (or it may not). It should cost you $A7 or less.  Replace the tube in the torch by the UV tube, and you are nearly in business. But wait: read the safety instructions.  It is dangerous to look at the UV tube. Extended exposure to UV light may cause cataracts and vision problems; in the dark your pupils will be wide open, and your torch is designed to spray light everywhere. Depending on the design of your torch, stick opaque tape (such as packaging tape) to block the light everywhere except in a wide slit in the direction you want it to go. It would be a good idea to use red paint (or a permanent marker pen) to put the words 'Do not look at the tube' on the torch. With luck, you now have a tin indicator lamp for 20% of the cost of the commercial article. It will also make most plain white paper and most white shirts fluoresce in mauve, as a simple test.Try it out on several pieces of float glass. Use of this experience is strictly at your own risk. I disclaim all responsibility for any injury to yourself, loss of funds, or damage to any glass product you may make. Why would you want to use float glass? Well it is cheap, and you can get it in many thicknesses. It makes an ideal medium for school projects, and for teaching slumping. Personally, I like to use a very sparse color palette (sometime monochrome) so float glass will allow me to achieve crystal-like effects, subtle diapering backgrounds (without glass paint) in leadlight windows, and when used with HiGlass some good effects in partially or totally fused glass windows. Whether it works for you depends (a) whether you are happy with transparent glass, and (b) the balance between base glass and colored glass in your designs. I also try out ideas for fused/slumped 3D glass objects in float before committing more expensive glass.